I’ve lived in or near Tokyo for most of my adult life, and until yesterday I never knew that one could swim outdoors in a 50-meter pool just a stone’s throw from Tokyo Tower. This city is full of surprises. For a swimmer accustomed to doing laps indoors, it a glorious change to set off across a 50-meter pool under bright blue skies while the bubbles your arms create with each forward stroke dance before your eyes like tumbling jewels in the ever-changing sunlight. That last line may seem a bit overwrought to some readers, but serious swimmers will know what I’m talking about. At the time of my visit to the Aqua Field pool, near Shiba Koen Station on the Mita subway line, two wide lanes were set aside for lap swimming. The rest of the pool was a vast open area for general frolicking. The pool, whose adjustable floor was set to a uniform depth of one meter, is fenced in and surrounded by shrubbery. One could easily miss it while walking past in the street, but within the enclosure there is a tremendous feeling of openness, with views of several tall buildings, including Tokyo Tower, framed against the surrounding sky. There is also a large raised terrace with even better views (including Zojoji temple nearby and the Izumi Garden Tower in the distance), with plenty of tables and chairs where one can relax and dry off in the breeze. Unfortunately, the Aqua Field pool is near the end of its season. Sept. 15 is the last swimming day. After that, the pool will close for a couple of weeks to undergo a transition into a futsal field, which is how it will remain until next summer. You can see photos of Aqua Field in both its summer Aqua and winter Field forms at the official website here. I wasn’t able to photograph the pool myself because there were signs everywhere forbidding it. (The photo at the top of this post was taken from a public street outside.) 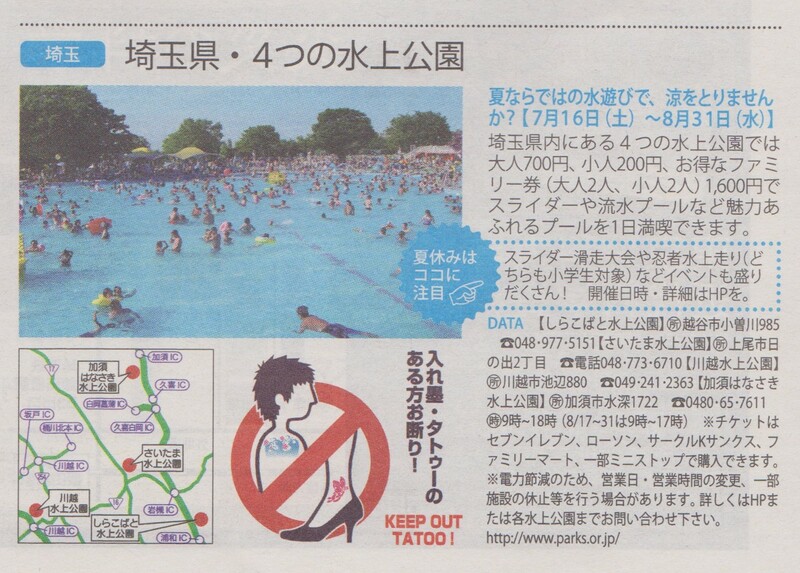 There were also signs everywhere reminding tattooed swimmers to keep their skin art covered up. Unfortunately, these are common prohibitions at public swimming pools here. But one rule that was not on the books was the usual Japanese requirement for everyone to wear a swim cap. Feeling the water flow through my hair was another refreshing change from the usual Japanese pool experience. Adult admission to Aqua Field is 400 yen for two hours, plus 200 yen for each additional hour. Hold on to the ticket you get on the way in, since its time will be checked on your way out. 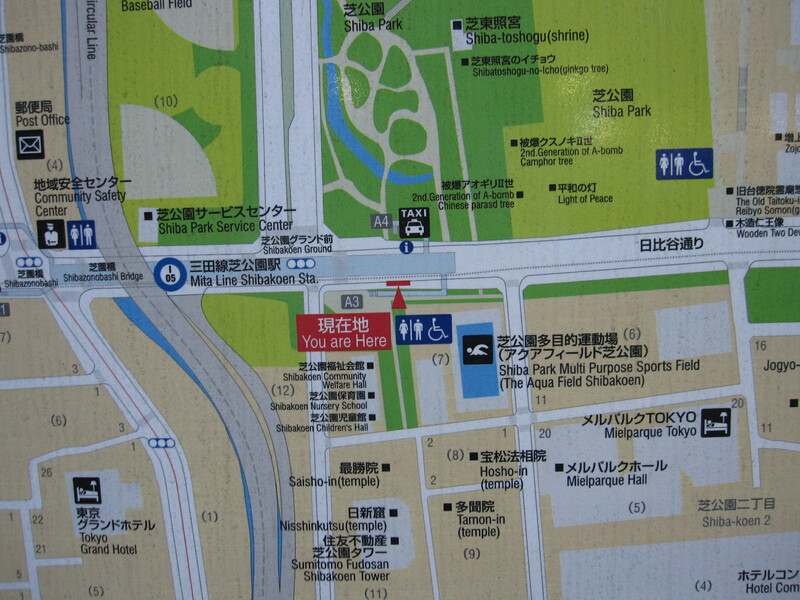 To reach Aqua Field, use Exit A3 of Shiba Koen subway station, turn left at the top of the stairs, and walk a short distance down a tree-lined path to find the entrance on your left. 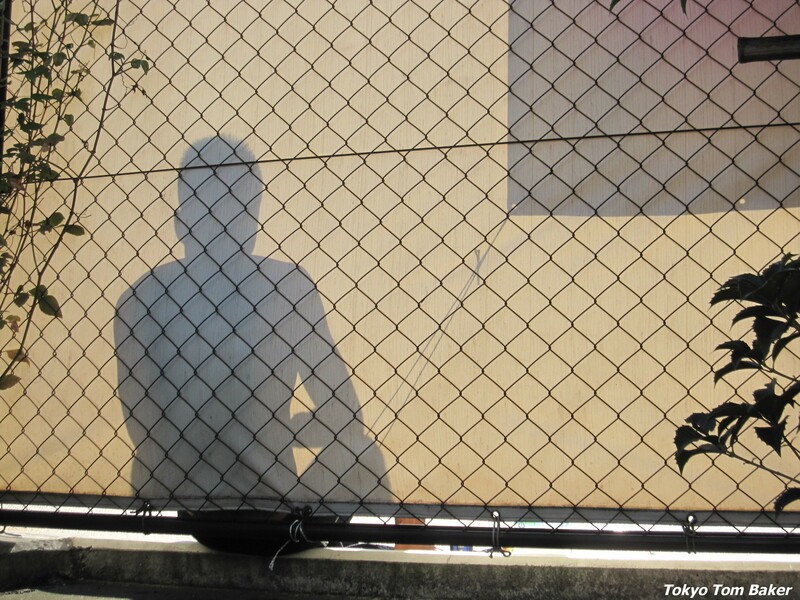 On a recent Sunday morning, before the brutal 2010 Tokyo heat wave broke, I paid a visit to the Ariake Sports Center in Koto Ward, Tokyo. In keeping with its name, it has a weight room and basketball and volleyball courts as well as a pool. But as usual, I went for the pool. Cost: Two hours of pool access costs 300 yen for adults, with kids half price. As at many Tokyo pools, you have to buy a paper ticket from a vending machine and show it to an attendant on your way in and your way out. Main pool: In photos I had found online, the 25-meter, six-lane pool is under a Crystal Palace-style curved glass roof, which looked like it might be able to slide open in nice weather. To my delight, this turned out to be the case, which meant that I was able to swim in sunshine and fresh air, which really does feel better than swimming completely indoors. Less delightful was the dense crowd, which gave the pool a March-of-the-Penguins atmosphere. There must have been 100 or more people in the water, mostly parents with children. 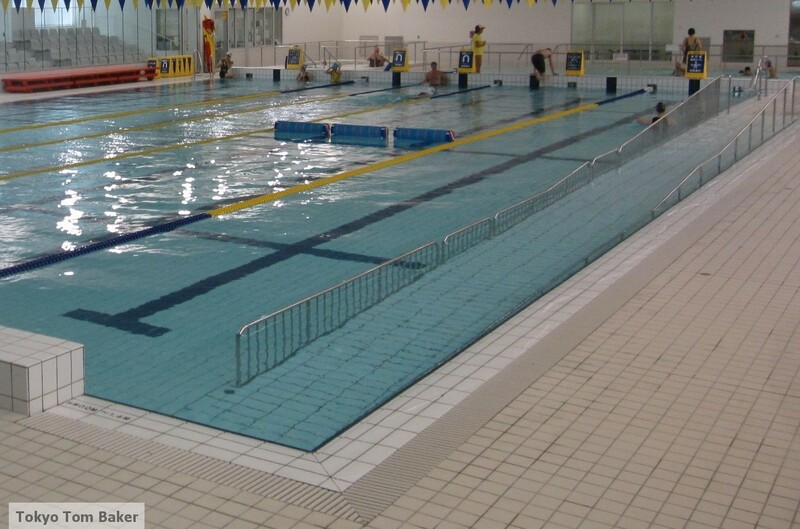 Only two lanes were clearly set aside for lap swimming. Although that was the least crowded part of the pool, there were about 10 people in each lap lane. I swam a few optimistic meters of freestyle, but had to switch to a deliberately slow breaststroke each time, and I was repeatedly forced to halt and tread water when the crowd ahead of me made forward movement impossible. I gave up and climbed out after a mere 100 meters. The line for the slide was very short, and so were most of the people using it. In fact, kids had to be at least as tall as a line on the wall to be allowed on, and I saw a lifeguard stop one little girl and make her stand against the wall to see if she qualified. She just barely made it, and that was because she seemed to have her hair up in a big lumpy bun under her swim cap. I think the lifeguard made the right call in letting her get away with it. Photos are prohibited in the pool area, including from a glassed-in observation lounge about two stories above the pool deck, but you can see what may be official pictures of the facility’s interior here, or better yet, here. Lockers and showers: The locker room is rather small, with no special features to speak of other than a spin drier for wet bathing suits and a hair drier for wet hair. 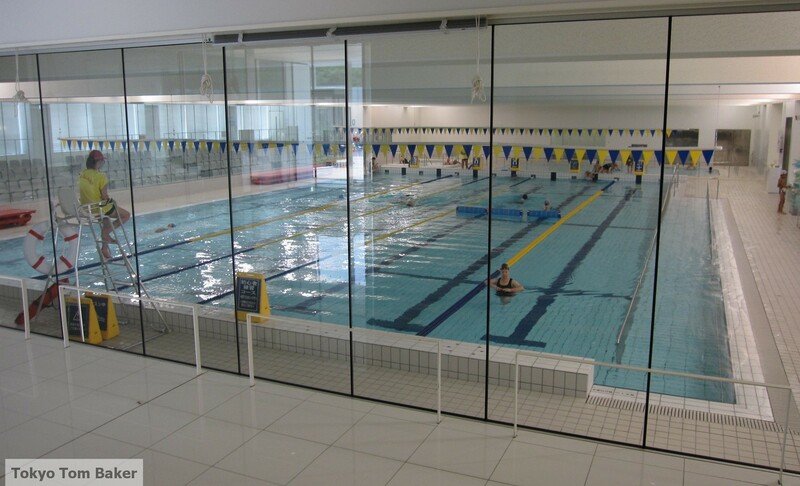 Wheelchair access: There are ramps and elevators, including a long ramp into the main pool. 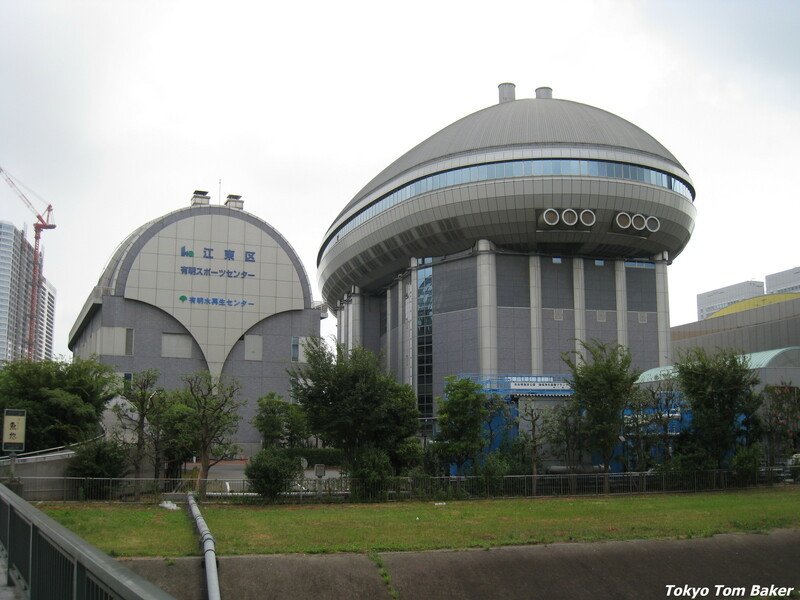 The building: The Ariake Sports Center consists of two side-by-side buildings, the taller of which contains the basketball courts and the smaller of which contains the pools. The facility has been reviewed by the website tokyoarchitecture, which likens the larger building to a mushroom, and the smokestack of a nearby garbage incinerator to a tree trunk. But there is another and much clearer botanical reference: The end facades of the pool building are shaped like the gingko-leaf logo of the Tokyo Metropolitan Government. Location: The Ariake Sports Center is about a 10-minute walk from either Ariake Tennis-no-Mori Station or Odaiba Keihin Koen Station, both on the Yurikamome Line, and a slightly longer walk from Kokusai Tenjijo Station on the Rinkai Line. See the official access map below. 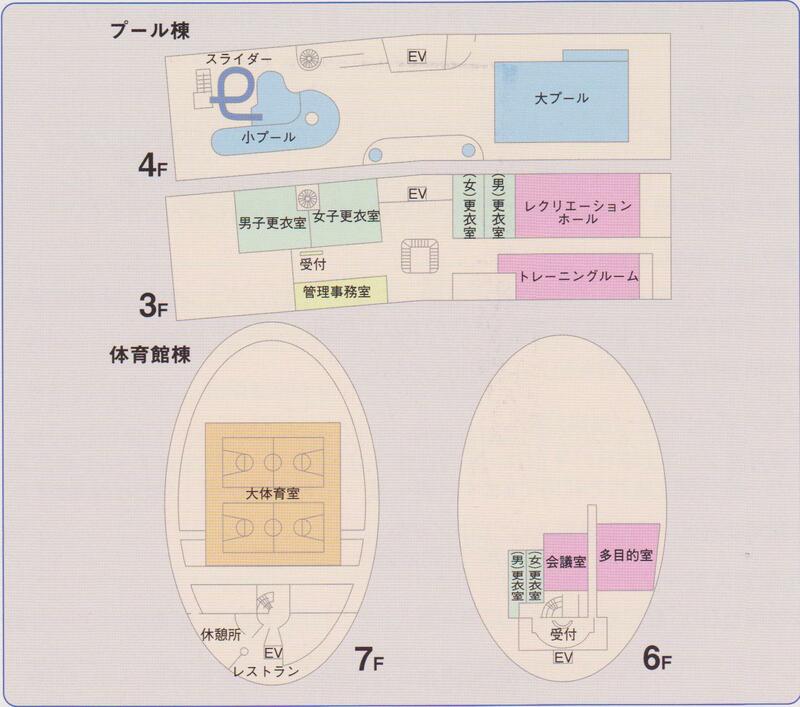 In April of this year, a lavish new public athletic facility opened in Sumida Ward, Tokyo. It includes exercise machines, aerobics studios, martial arts areas, several wood-floored courts for basketball or volleyball, two open-air playing fields on its roof, a café, a shop and a one-room museum about local sports heroes. It also has a pool. I went for the pool. Cost: Two hours of pool access costs 500 yen. That may sound simple, but it gets complicated. First, you have to buy a paper ticket from a vending machine. Then you show the ticket to the attendant at the front desk, and mention that you plan to swim. 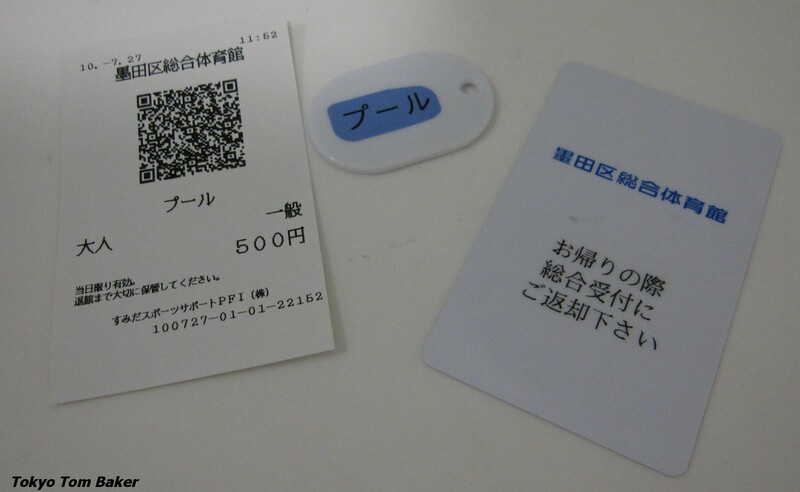 The attendant will give you a plastic card and a plastic token. Holding all this stuff, you must try to get through the automated ticket wicket by scanning the paper ticket’s QR code over a small glass window. Once you are inside the locker room – remember to take off your shoes – you can use the plastic card to claim a locker. Then, once you have gotten into your swimsuit – and your cap – you take the plastic token downstairs to the pool and give it to the attendant there. Finally, on your way out, you’ll need to use the paper ticket to get through the wicket again. Got it? Main pool: The water in this 25-meter, seven-lane pool was crystal clear on the day of my visit, but this is a fact that I may not bother to mention in most of my future pool reviews. In Tokyo, you can assume that the water will be clean. It is not rare to put your head under at one end of a pool and be able to see the opposite wall as clearly as if the pool were empty. Leave your Secchi disc at home. There were three clocks visible from inside the pool, but all of them were on the same wall on the same side of the pool, which made it less easy to glance at them than if they had been arranged around the pool. The crowd was light enough during my visit (at noon on a weekday) that I often had my lane to myself, so I was able to get some backstroke in. Around the pool: There is a small Jacuzzi and a large wading pool. There is tiered seating for spectators behind glass. Lockers and showers: The locker room is so large that I actually got lost in it, and took the wrong exit. I had to turn back when I realized that I was on my way to the weight room in my bathing suit. Soap and shampoo are provided in the shower area, which is decorated in shiny black tile and includes a furo bath large enough to hold five or six people. There is also a spin drier to put your swimsuit in so it won’t soak your bag on the way home; this seems to be a pretty standard feature at Tokyo pools these days. Wheelchair access: There appear to be plenty of ramps and elevators, including a long ramp into the main pool. The locker room includes a spacious wheelchair stall. The building: Two features of the building caught my eye. 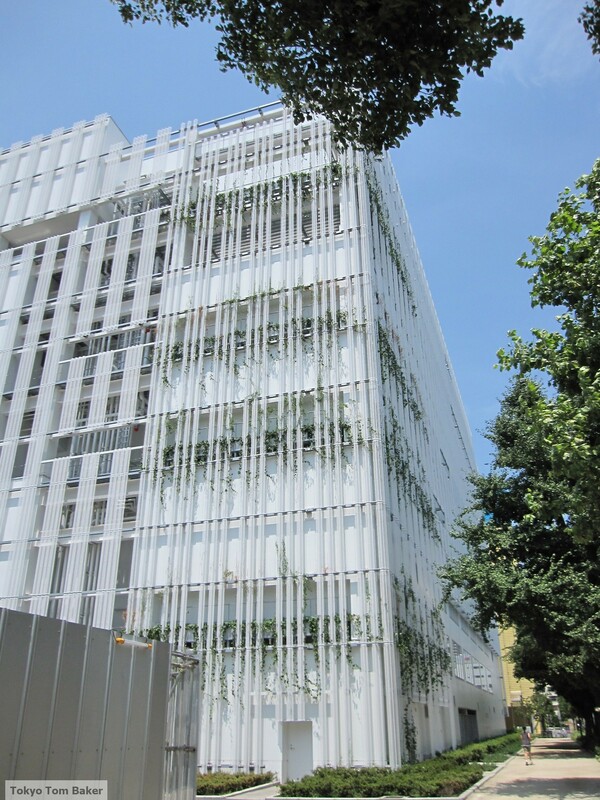 The first was that efforts are apparently being made to cover the building in an eye-pleasing and eco-friendly “green curtain” of the type that is described here and shown here and advocated by Azby Brown. 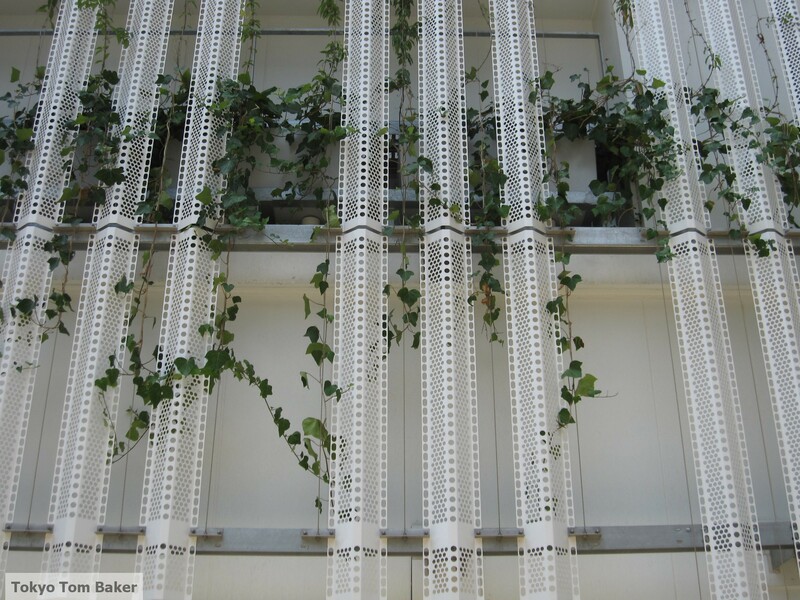 The exterior of the building is essentially a giant trellis, and green plants are growing on it in various places. The building is less than a year old now, but presumably the green coverage will expand over time. The other feature I approve of is that the café operates as a beer garden in the summer. Location: The Sumida-ku Sogo Taiikukan (Sumida Ward General Gym) occupies the northeast corner of Kinshi Koen park, a short walk from Kinshicho Station on the JR Sobu Line and the Hanzomon subway line. See the official access map here. 1. When entering a Japanese locker room, as when entering a Japanese house, you are expected to take off your shoes. 2. When swimming in a public pool, you will almost certainly be required to wear a swim cap – even if you are bald. 3. Most pools exclude people who have visible tattoos. If this means you, then plan to wear your least revealing swimsuit, and cover up further with a T-shirt or even bandages if necessary. You are currently browsing the archives for the Swimming pools category.